Activity in China's manufacturing sector increased again in January, but separate surveys of purchasing managers' sentiment painted a mixed picture on the pace of recovery and hinted at continued weakness in export markets. HSBC's manufacturing index rose to 52.3 from 51.5 in December, stronger than its initial "flash" estimate of 51.9 released last week. A reading above 50 signals expansion in the manufacturing sector. But China's official PMI posted a surprise fall to 50.4 from 50.6 in December, coming in well below most analysts forecasts. "The mixed signals cast some doubt on the strength and sustainability of the recovery," Nomura analysts said in a research note. Manufacturing makes up a large part of China's economy, and the sector is considered a barometer of global growth because of the nation's position as the world's biggest exporter. The official PMI data suggested the improvement in new orders in January was driven by domestic demand, as the sub-index for new export orders fell to 48.5 from 50, indicating contraction. Figures from HSBC reflected brighter prospects for exporters with orders increasing after a decline in December, but the bank said growth in infrastructure, higher consumer spending, and re-stocking were providing the biggest boost. "A higher reading of January final manufacturing PMI implies that China's manufacturing activity is gaining further steam on the back of improving domestic conditions," said Hongbin Qu, chief economist China and co-head of Asian economic research at HSBC. China has grown rapidly over the past three decades to become the world's second biggest economy, averaging 10% annual growth in gross domestic product. But it felt the impact of slugging growth in the United States and recession in Europe last year, with GDP growth declining to 7.8%. While fourth quarter growth of 7.9% confirmed China had avoided a hard landing, the recovery looks set to be steady rather than spectacular. The U.S. saw GDP contract for the first time since the Great Recession last quarter, and Europe's top economy -- Germany -- also slipped backwards. The deputy governor of China's central bank expects growth to recover slightly to 8% in 2013. Speaking at the World Economic Forum in Davos last week, Yi Gang also warned inflationary pressures would increase. Friday's data contained evidence that this is already happening. 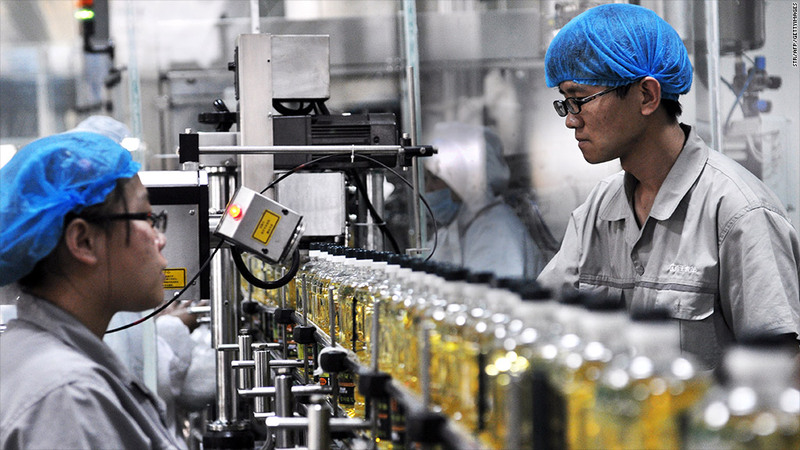 The input price index in China's official PMI jumped to 57.2 from 53.3 in January. "The rise of input prices in the PMI and food prices in recent weeks reinforces our view that inflation will continue to surprise consensus expectations on the upside in 2013 and force the government to tighten policy," said Nomura's analysts, adding growth would slow later in the year as the central bank raises interest rates.